Below, in chronological order, I’ve translated the highlights of the press conference. 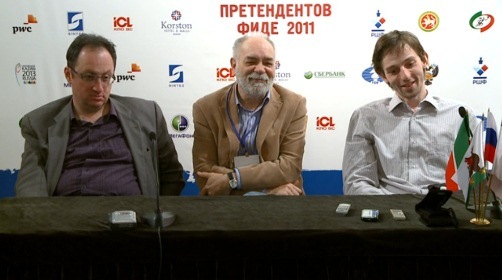 You can still watch it in full at the Russian Chess Federation website, from where all the screenshots are taken. The questions weren’t picked up clearly by the microphones, so any I’ve included should be considered partial guesswork. I’m no great storyteller. It’s easier for me to answer questions so I welcome any questions. What can I say? The match was very tough. Due to certain opening peculiarities it turned out that I only played with Black, except in the last game i.e. the other four games where I had White couldn’t be considered games. If in the long ones I at least asked questions – or even didn’t ask questions, but tried to ask questions, or give that appearance… in the rapid – well, you saw for yourself what sort of games they were with White. But then with Black, surprisingly, things didn’t go so badly for me. In the fourth classical game I got a good position after the opening, and even though after that I was closer to losing than to winning… in general it would be hard complain about how things went with Black. Nevertheless, of course, it’s very difficult when you’re only playing with Black. I think you all understand why. What else can I say? In general, it was the toughest of steps, but ahead of me are two more very, very difficult steps. Yes, it was a very tough match, very difficult. I played five games with Black and one with White, so it was pretty tough. But in some games I got lucky, in some I played well. I think in Blitz I played really well. And I won and I’m very happy with that. What can I say? Today, overall, the quality of the games in our match was very low, but luck was on my side. That’s what I’d say. Because in the first four games there were extremely bad mistakes – blunder after blunder – with White, in general, I played terribly. Perhaps that’s the worst match I’ve played in tie-breaks. But luck was on my side. It’s all nerves and luck. The main thing was to get through. I managed, with an enormous amount of luck, to do that. Did you notice the blunders during the game? No, I didn’t notice them. Though I realised I was playing very badly. I didn’t see anything. I played badly. That’s all. Morozevich and I once played a match. It got to blitz – I won the first one. And in the second I lost a crazy game, and he immediately told me I’d had mate-in-two. And he was right. I think the only thing you could say is that there are people who are more sprinters and others who are more marathon runners. For some people it’s easier to maintain their concentration evenly at a more or less high level for four or five hours, while for some it’s easier to have half an hour, an hour – but with maximum concentration. Maybe that’s one of the reasons for my time trouble. An amusing moment comes when Grischuk’s asked about the wins Kramnik had missed in the final classical game. Grischuk says that afterwards his team had looked at both Averbakh and Levenfish & Smyslov’s endgame books (in electronic form, Grischuk clarified for a surprised journalist!) but couldn’t find the 3 v 2 rook ending Kramnik could have gone for. Well, first of all, they’re unlikely to criticise me for it now. I understand that if I’d lost then of course all kinds of things would have been said – you’re not a man, and so on. What was behind it? The fact that… well, I did actually play a couple of games with White, with no more success. And look – Volodya drew all his games – all the classical and rapid games – so it’s not so easy to beat him. Today it was a tie-break, full of mistakes from both sides. Then luck was on my side – and I’m very glad it happened like this. Kutin: The last rapid game was the most important? Well, all of them, but ok. Basically the quality was pretty low, so it’s difficult to discuss it seriously. Normally the quality of tiebreaks is really high – I don’t know what happened today. A brave, but perhaps foolhardy, journalist then asked Gelfand about veterans winning major international tournaments (the question, which seemed to mention Paul Keres, had to be repeated two or three times, with Gelfand raising his eyebrows ever higher!). Korchnoi played his first World Championship match when he was 47. Geller won the USSR Championship in 1979 before my very eyes – and he was 54. I think it’s simply that there’s a new wave – for the press it’s interesting to write about the young. What can be written about me or Ivanchuk – we’ve been around for so long already. But So, or Giri – they’re young, unknown, so it’s interesting to write about them. That gives the impression that the young play well while we’re no longer capable of playing – we’re just veterans. And do they write about you in general? I don’t know. In newspapers, no, but probably on websites. 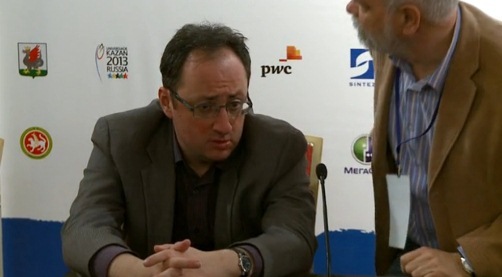 Gelfand: That’s a tough question. I’d have to think about it. I can’t answer right away. No doubt Vassily thought about it… I’ve got a lot from spending time with chess players. But what did it take away? I don’t know. 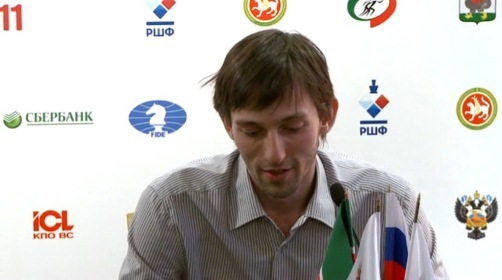 Asked about how they’ll prepare for the final, Grischuk again says that he hasn’t thought about it. Gelfand notes the Peter Principle (actually Parkinson’s Law! ): “Work expands so as to fill the time available for its completion”. 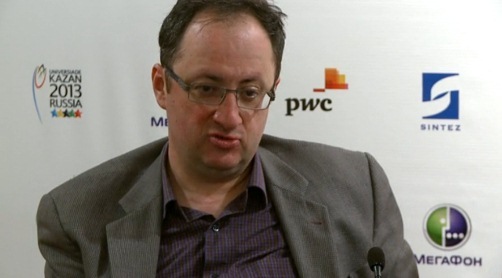 Gelfand: No, what’s there to explain here? Chess is a sport – one day one sportsman wins, another day another – you shouldn’t draw general conclusions. All the chess players who gathered here are very strong players. And they were all ready. It turned out that such-and-such players won. But you’ve got to understand that it could have gone differently. Grischuk: And I’d say in general. It’s very fashionable to criticise the qualifying system – but if you go back to the origins of competitions, the Olympics in Ancient Greece, and so on. They started off in order to identify the strongest person. But now people pick out the strongest at the beginning, for example Aronian, and then if, god forbid, he doesn’t win, the system’s considered bad. Grischuk: "They're unlikely to criticise me for it now"
Once again, thanks for this translation. Very interesting! And mishanp’s characterization of Kutin (“Boris Kutin (a man who doesn’t seem entirely comfortable in any language”) is hilarious. It’s a shame Kramnik & Kamsky didn’t give any press conferences, I was especially curious about what Kramnik had to say. Thank you for the nevertheless interesting translation. Anyway, I think Shipov had suggested that drawing so quickly with White clearly wasn’t “world champion play”. But a world champ’s first priority has always been to bring his opponent to uncomfortable turf; and if he’s ready to sacrifice his own comfort for that sake, it’s even greater!! His strategy was, in a sense, much riskier than Tal’s; but still people condemn him as boring!! The public don’t realise that match-strategy is more off the board than on it. Kamsky gave a short post-match interview to a newspaper from Kazan. Maybe that’s of any interest to you.